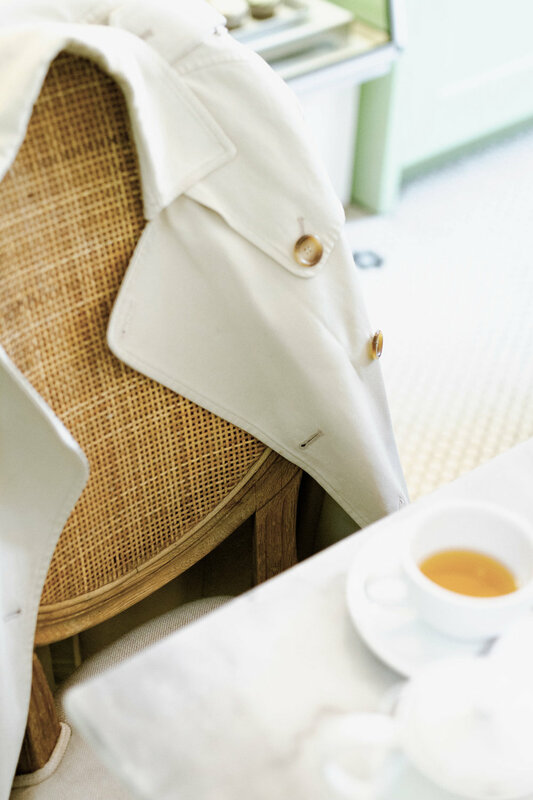 It is a place that, no matter how your day has gone, is there… no matter if you simply need a quick cup of their signature, comforting tea and cookie to yourself to collect your thoughts… or to gather for a fun, leisurely brunch for four. Butter is wonderfully constant in its ability to brighten and lighten the day; To create a moment of peace and enjoyment, and a place to take time away from the world, even if, temporarily. 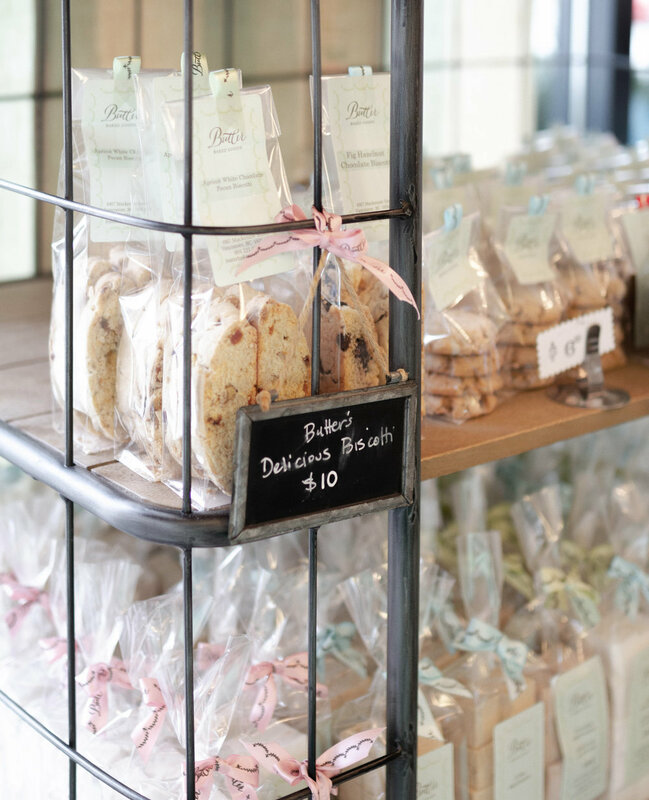 Certainly also a favorite spot for picking up perfectly creamy Birthday cakes, a wonderful array of classic boxed cookies for Mother’s Day, or those irresistible, fluffy marshmallows for a special person in your life, just because. And while days might be busy, and moments of comfort and repose might be less than frequent, enjoying a slice of goodness undeniably does wonders for the soul. Perhaps that why so many gift Butter items to those they care about most dearly. One of Rosie’s personal favorites, biscotti. When I visited Butter for the first time, the beauty of it all, amassed, nearly brought tears to my eyes. I recall the sweet, sweet aroma so unforgiving in its irresistibly delicious nature. The lighthearted, pretty floral wallpaper and fresh green cabinetry. The cool marble countertops, and select antiques, to taste. And then, of course, there were the baked goods. And even though the one I selected that special day has long been forgotten, the memories have certainly forayed into a blur of beautiful flavors. I wondered who the person might be that had created such an incredible spot in our city; a spot so unlike any other. Fast forward several years, three books later, and a new location (amoungst other new additions) Butter has considerably become a household name. Today, we have the privilege to learn a bit more about Rosie Daykin (owner) and her thriving business. She is about to launch her third book, and as always, ever-creating and inspiring with her unique point of view. And that is indeed a point of view that we could endlessly enjoy. Rosie’s daughter, India, pictured above in the playful photography. No. 01 Before you opened Butter, you were an interior decorator. What lead you to creating the look and feel of Butter? When I decided to open Butter I simply treated my baking as I would have my interior design clients. I set out to design a home for them that really reflected their personality and style, a style I often refer to as nostalgic home baking. I wanted it to be a little like Grandma’s house but younger and fresher. Butter’s original home was located in a very old building on Dunbar Street so it had lots of character built right in but in 2012 when I moved to 33rd and Mackenzie I took on a brand new, raw space. I used the opportunity to modernize the design just a smidge… little things like blowing up the pattern of the floral wallpaper by 30%, which made it feel slightly more graphic and bold, and not so sweet. Choosing to keep the ceilings open with the pipes exposed added a little dash of the industrial, which was a nice contrast to the romantic calligraphy of Butter’s logo. It was about finding that necessary balance. No. 02 Do you recall your first customer when you opened your doors? Oh I wish I did but that first day, first week, even that first year was such a blur. The beginning was pure madness for me at the bakery as I worked to find my sea legs. We sold out of everything that first day which meant I had to head right back in to the kitchen and start again (lol). In those days I didn’t have any staff, just some supportive family members, but within in a couple of months I found my groove and and hired some help—and the rest is history. A favorite little creature brought from her very first shop. A full and wonderful selection of treats, ready to go (including her famous marshmallows—sold both locally and all the way in Japan). No. 03 Your life-long passion for baking surely lead you to open Butter, but at what moment was it the right moment to open? I had always wanted to open a bakery, ever since I was a little girl. But life takes you on its own journey and I knew that the bakery was going to be a huge commitment and I had to be in the right place in my life to take that on. I wanted to wait until our daughter India was old enough that she didn’t rely on me as heavily… which was smart because she could then operate the till (lol)! But honestly, I just got to a point where I thought if I don’t do it now, then when? 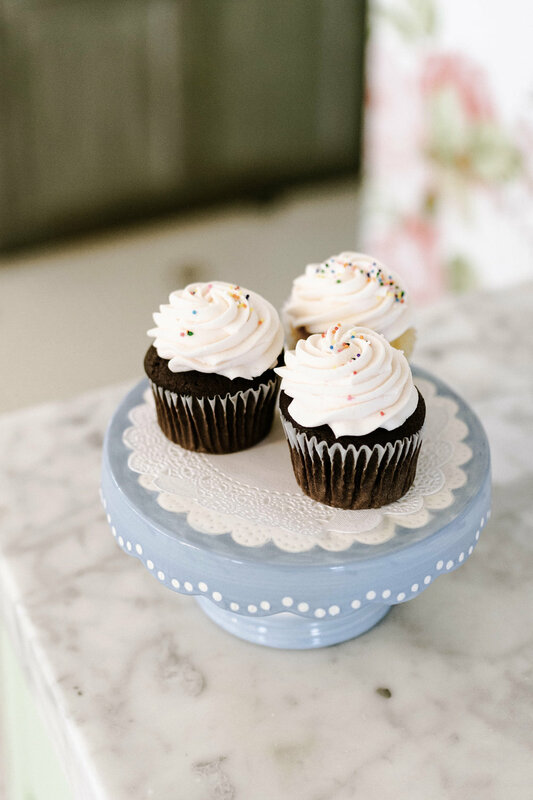 It wasn’t just an emotional decision, the business side of me was also very aware that our city was sorely lacking a bakery like Butter and I thought the community would respond well to delicious, classic cookies, pies, bars, and cake! No. 04 What has been the most interesting part of developing your books? And how did you feel when you were about to work on your first as compared to your third? The most interesting part I would have to say has been learning all about the publishing world—such a great education! I knew nothing about it at all prior to signing my book deal. When my publisher asked me to go home and write an outline, I literally had to google, “How to write a book outline”. But I knew how to bake and I was excited to share that knowledge with people, but to do so in a manner that really speaks to the way I approach things. I kept it simple and straight forward with lots and lots of pictures (I’m a visual learner so that is huge for me in cookbooks). Writing my third proved just as exciting because I was able to step out from under the Butter umbrella and write from home, focusing on breakfast, lunch and dinner (don’t worry… I didn’t forget about dessert!) as well as lots of interior shots to reflect my love of design. This makes book three feel very personal and special to me. We highly recommend booking a high tea at Butter, served in these lovely teacups. No. 05 You travel to beautiful, inspiring places—what is your favorite thing to experience in a different city, and also to bring back with you? I absolutely love to travel! It is where I find all my inspiration, whether that be creatively, aesthetically or emotionally. It fills me up, and when I start to feel a little flat with life I know it’s time to get out of town (lol). About 6 years ago my husband bought me a new camera and it truly was life changing. Photography has since become a real passion of mine, even though I’m not that great at it, it makes me very happy. Being so visual I’ve always been able to see images in my eye that I’d like to capture but not the skill or knowledge to execute them. That little Olympus EP5 was a godsend. It is now the thing that excites me most about travel! Knowing that I’ll be able to wander and photograph new places… that’s really my favourite thing to return home with—my photos.